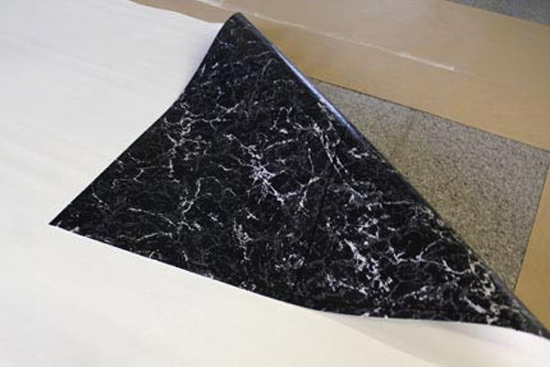 Painted and stenciled floorcloths have a rich history – used in homes throughout England and the United States prior to the invention of linoleum, they were often made from recycled canvas ship sails. 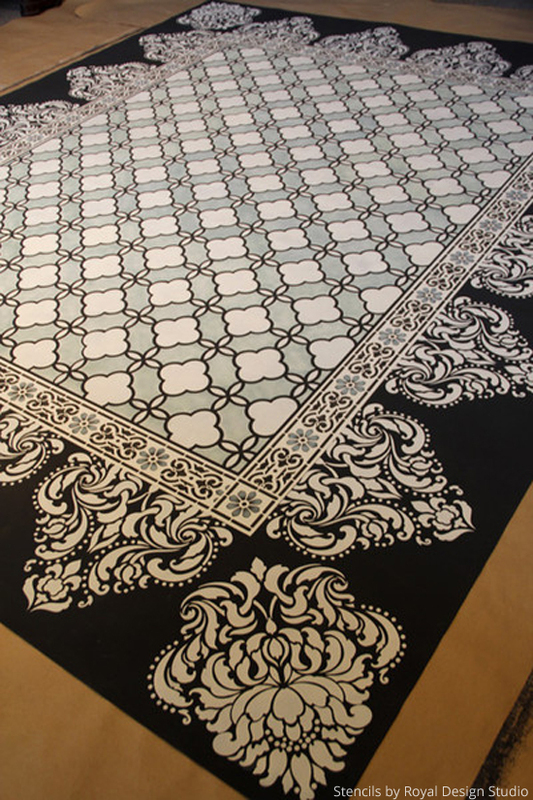 For a quick and easy alternative floor covering for a trade show, Melanie created this amazing stenciled vinyl floorcloth using Annie Sloan Chalk Paint on the BACK side of some pre-cut vinyl. 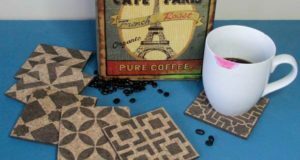 You can create a similar project with either traditional floorcloth canvas, but we recommend using a better quality, thicker vinyl for use in an area that will get regular traffic. Roll on on two coats of Annie Sloan Graphite Chalk Paint. 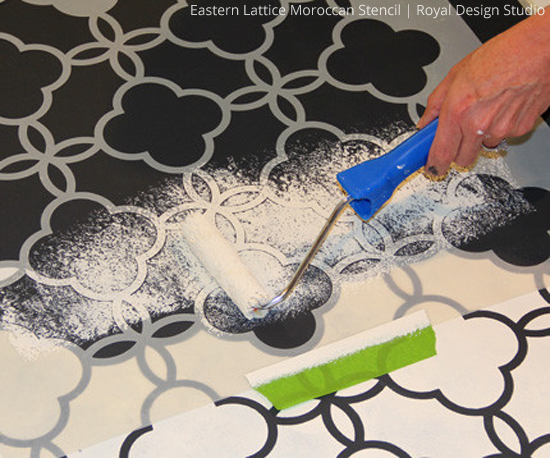 You can easily mix and match several stencil patterns on a large surface to create your own custom design. 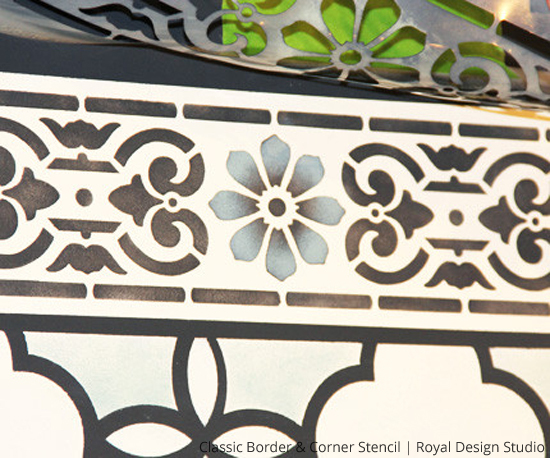 Choose stencil designs in a variety of scales with similar elements. For inspiration, take a look at the stylistic variety within a typical oriental rug. 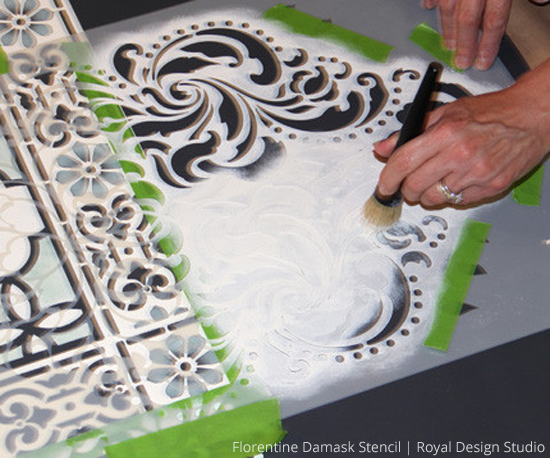 For this project, Large Eastern Lattice Stencil is used at the centerpiece, framed with the Classical Border & Corner Stencil. 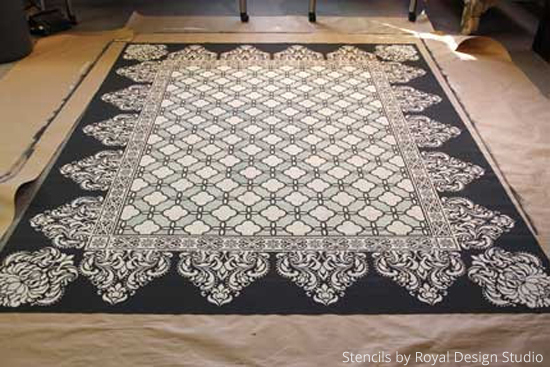 The Florentine Damask Stencil creates the lacy scalloped edge and corner detail. 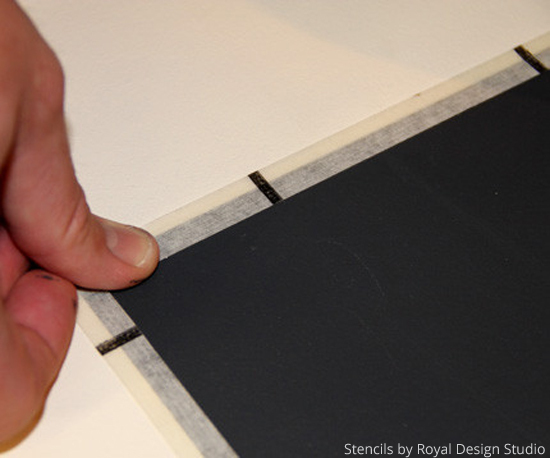 Next, mark off the placement of your border – calculate the space needed for the outer elements and measure in from the outside edge. Next, Roll on two coats of Annie Sloan Old White Chalk Paint with a short nap 4″ roller for the border. 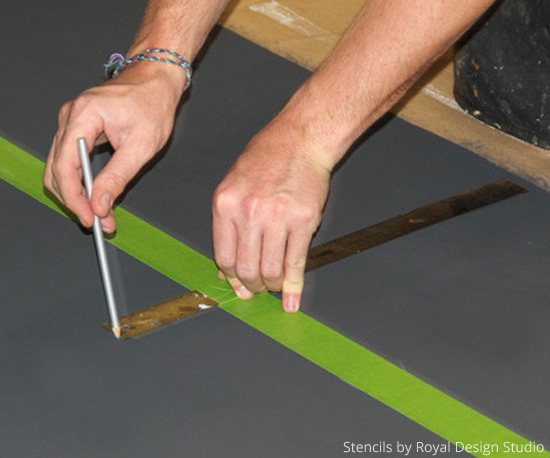 Tape the stencil securely to minimize seepage. 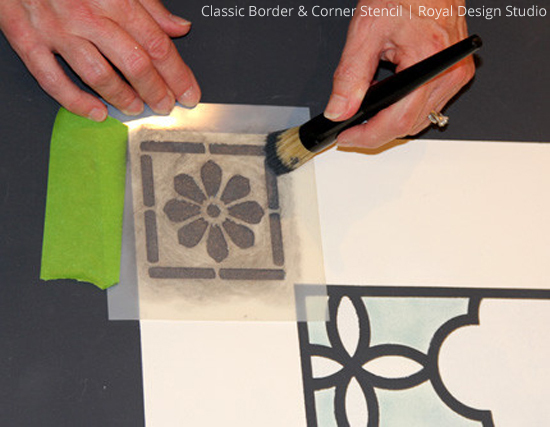 Chalk paint dries quickly so you can go back over to touch up details with a smaller stencil brush. 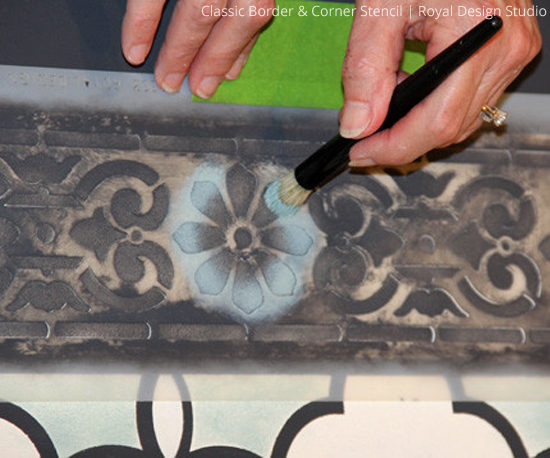 Here, the petal details in Duck Egg Blue are stenciled over the white border background using a dry brush technique with a 3/4″ stencil brush. 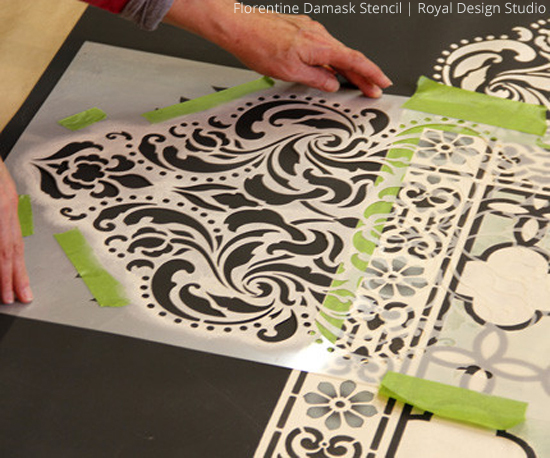 Position the Florentine Damask Stencil edge, taping off to protect your work on the border. 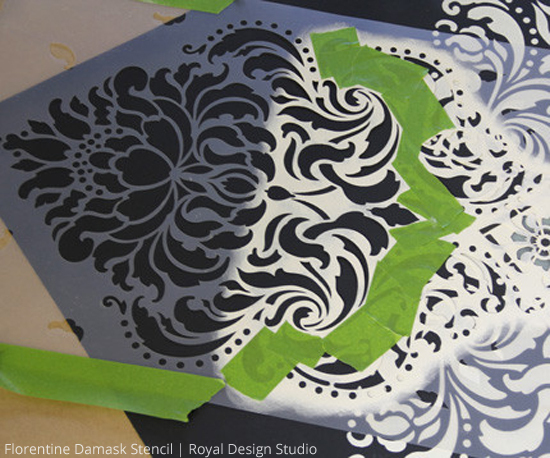 Again, notice how she’s taped off the black areas of the design while working with the Old White Chalk Paint. 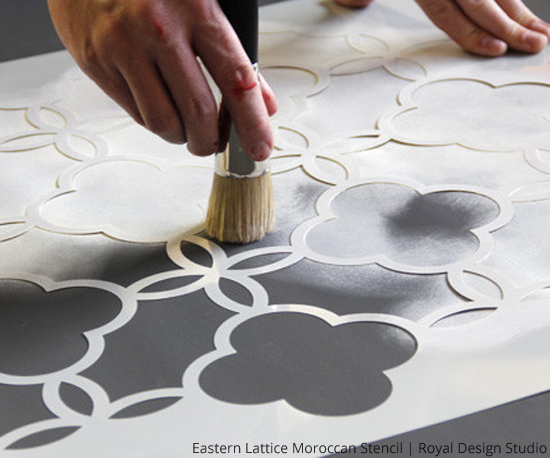 Melanie taped of part of the stencil design to fit a damask stencil “petal” in each corner – the perfect finishing detail! 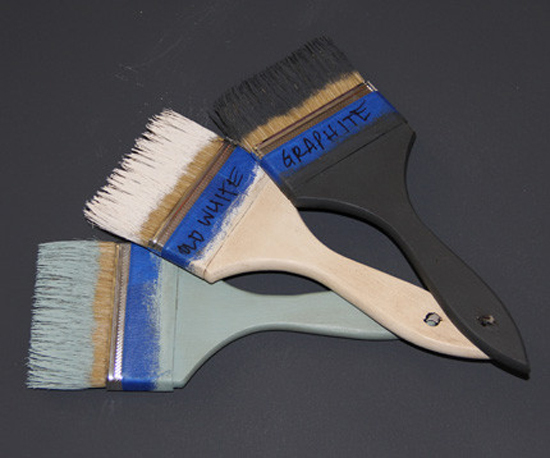 Finally, Seal and protect your work with 2 two thin coats of Annie Sloan Lacquer, a matte, water-based finish designed to work with the Chalk Paint. 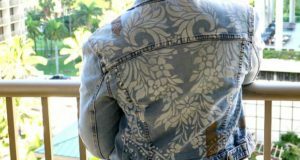 This tutorial was originally published on Melanie’s blog. 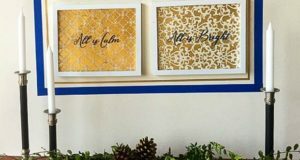 To see more details, and the floorcloth in her chalk paint display at the San Diego Home Show, visit her blog, Designamour! This is RAD~!! As soon as I have some money to buy supplies, I am going to make this. I really love this. 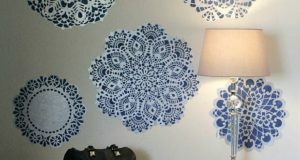 This would be something people would see and say “damn can you make me one” or “were did you buy that I want one” lol.